Is Trust Binary? 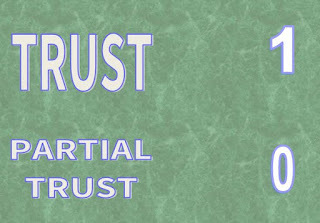 - Seek to turn on the "Trust Bit"
I believe Trust Is Binary. To me, Trust cannot be partial. You either trust someone, or you don't. You can be in a state of distrust until you hit a certain point and then you flip the 0/1 bit and come to a point of trust. You may even trust someone completely and then have them do something to lose that trust. It's a 0 or 1 thing..... Binary. Eventually a person that you distrust to some degree may do something to help you switch back to trust. 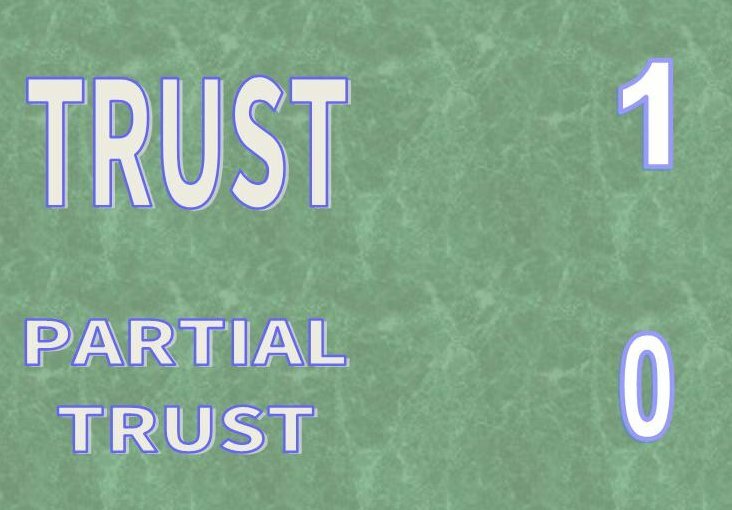 You cannot say "I trust you partially". Perhaps I have been naive in my life, but to me, when I trust someone, I do so explicitly. This approach has caused me some disappointments. That being said, the occasional problem caused by this will not override the benefits of trust in others. Market conditions, family situations, boredom, incorrect skills, or a multitude of reasons can change outcomes. Things do and can go wrong, but I know it is RARELY because I have mistakenly given trust. To tell someone you trust them and then to give them only partial trust is untruthful. You don't really trust them. Be honest about it. This brings up an interesting dilemma.... Where do you start? Do you start from a position of trust with everyone? Any experienced business person knows this might be unwise. Or is it? Do we knowingly get into business deals where we know we cannot trust the other party? Isn't that relationship destined to have problems? Trust is such an important thing that I have gone out of my way to deal with people and companies I feel I can (or want to) trust. An interesting statement. It simply requires "Trust". It doesn't say we "sort of understand". It doesn't say we "partially believe". It says "truly believe". PERIOD. The assumption is that trust is existent, and is Binary. It is either there, or it is not. A one or a zero. Life is easier when your peers can learn and solve problems together instead of worrying about trusting each other.